July 5, 2012 | David S. Maldow, Esq. Avaya, fresh off its purchase of Radvision, continues to expand its rich media collaboration portfolio. 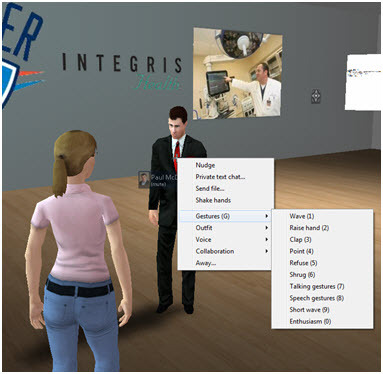 This particular innovation, AvayaLive Engage (previously Avaya web.alive), is taking business communications in a completely new direction by using videogame technology to allow people to meet in virtual spaces using personalized avatars. Based off the Unreal gaming platform, AvayaLive Engage allows organizations to create custom online environments for hosting face-to-face meetings, discussion groups, presentations, or anything else you can imagine. I recently had the opportunity to meet with Avaya's learning practice leader, Paul McDonagh-Smith, who took me on a tour of Avaya's demo environment, and gave me an invitation to an actual online event, TEDx Boston 2012. TEDx is an independently organized TED event, hosting the kind of informative and entertaining presentations that have made TED world renowned. TEDx reported approximately 600 unique online visitors over the course of the day, from 29 countries. The peak crowd was 37 attendees, and throughout the day there appeared to be about 20ish people in the virtual auditorium any given time. Considering that it can be difficult to get over 100 people to watch a typical live webcast, these numbers are impressive for an unfamiliar platform. Interestingly, there were 543 visitors on the following day, although there were no additional presentations. Apparently people enjoyed the platform so much, they came back the next day to see if anything else was going on, or perhaps to show colleagues and friends how it works. The big question is whether the use of AvayaLive Engage made a difference to the way the TEDx event was perceived online. In a word, absolutely. I have attended countless webcasts and watched hundreds of presentations on YouTube. They were all completely passive experiences. On the other hand, I didn't just feel like I watched the TEDx show, I felt like I attended it. I was "present" for the event. The fact that I could walk around the auditorium, while seeing and interacting with other virtual attendees made it a very different experience than a passive webcast. At the end of the day, the event, and the presentations, were far more memorable and had far more impact than a simple webcast. While the TEDx event made for a fantastic demonstration of the power of virtual avatar-based presence, the potential applications for this technology go far beyond the one-to-many presentation dynamic. As Paul and I walked through Avaya's demo environment we visited a number of virtual locations, including the typical board/meeting room (above left) as well as various theaters, lecture halls, office environments, and private meeting areas. We even walked past a group of people actually using the environment to host a multiparty interactive meeting (above right). As I walked past this meeting I saw (or heard, to be more accurate) one of the power features of the solution, the spacial/positional audio capability. When I stood across the room from the meeting, I could not hear what they were saying. As I walked closer to the meeting, their voices gradually became louder. This allows for multiple groups to use common areas, and also allows for a sense of privacy. Remember, customers can create their own environments, and set their own audio controls, making some areas "listen only" or controlling the range of the audio fadeout. The number of public, private, or semi-private areas, how they look, and who can access them, are totally up to the organization hosting the environment. "AvayaLive(TM) Engage bridges the buzz and exploration of physical classrooms and meetings into a digital domain without losing the emotional engagement that lies at the heart of good collaboration. This is not an either / or conversation where the choice is about physical or digital collaboration - we're bridging both together..."
The ability to customize your avatar is also appreciated. I did not take the time to customize my avatar for the demo and went with the random avatar that was assigned to me, which is why I am female with a ponytail in the screenshot above. I later logged in again to customize my avatar and was able to come up with a more reasonable approximation of myself in a few minutes. It may seem trivial, but these types of small details can make or break the immersive effect. Avaya is wisely balancing the need to keep things simple for new users, with the desire to add power features for advanced users. The solution is browser-based, with no heavy install or complicated configuration. The basic controls are simple, you use your mouse to "look around" and use the standard videogame movement keys (WSAD) to move your avatar forward, backward, left and right. There is a small panel that opens up for text chat, and the solution automatically detects your microphone and speakers, allowing for configuration-free audio communications. A complete "newbie" can log in, walk around, and start interacting in minutes. Advanced users can display presentations on any of the virtual display screens on the meeting room walls (I was able to share my desktop with Paul on one of the virtual screens with no trouble), and access a number of useful features (laser pointer, webcam sharing, file sharing, co-browsing, etc. ), and fun features (waving, clapping, gesturing, etc.). The almost complete lack of a learning curve is important, after all this is a business tool. The sooner users can get comfortable with the interface, the sooner they will stop "playing" with the controls and get down to business, whether it is watching a TEDx event, meeting with colleagues, or hosting a presentation for potential clients. If you have never played an immersive videogame, you may have trouble understanding the value of this solution. But you shouldn't be so quick to write it off as a mere novelty. Yes, that is my level 85 gnome in the screenshot above, and yes, my gamer background did draw me to cover this particular solution. But the value of the AvayaLive Engage solution is real. The popularity of Second Life is testament to the fact that this type of platform can be used for more than just gaming. Unfortunately for Second Life, they did not properly control the environment which left it open for inappropriate and un-businesslike behavior. Regardless, this type of technology inarguably provides a far more immersive, memorable, and interactive experience than a mere audio-call. Just because it may actually be "fun" doesn't mean it isn't a serious business tool. The big question is whether the use of AvayaLive Engage made a difference to the way the TEDx event was perceived online. In a word, absolutely. I have attended countless webcasts and watched hundreds of presentations on YouTube. They were all completely passive experiences. On the other hand, I didn't just feel like I watched the TEDx show, I felt like I attended it. I was \"present\" for the event. 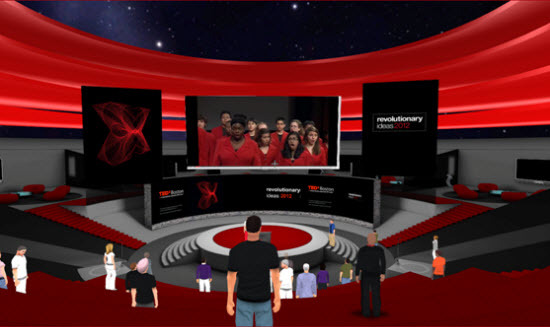 The fact that I could walk around the auditorium, while seeing and interacting with other virtual attendees made it a very different experience than a passive webcast. At the end of the day, the event, and the presentations, were far more memorable and had far more impact than a simple webcast. As I walked past this meeting I saw (or heard, to be more accurate) one of the power features of the solution, the spacial/positional audio capability. When I stood across the room from the meeting, I could not hear what they were saying. As I walked closer to the meeting, their voices gradually became louder. This allows for multiple groups to use common areas, and also allows for a sense of privacy. Remember, customers can create their own environments, and set their own audio controls, making some areas \"listen only\" or controlling the range of the audio fadeout. The number of public, private, or semi-private areas, how they look, and who can access them, are totally up to the organization hosting the environment. \"AvayaLive(TM) Engage bridges the buzz and exploration of physical classrooms and meetings into a digital domain without losing the emotional engagement that lies at the heart of good collaboration. This is not an either / or conversation where the choice is about physical or digital collaboration - we're bridging both together...\"
Avaya is wisely balancing the need to keep things simple for new users, with the desire to add power features for advanced users. The solution is browser-based, with no heavy install or complicated configuration. The basic controls are simple, you use your mouse to \"look around\" and use the standard videogame movement keys (WSAD) to move your avatar forward, backward, left and right. There is a small panel that opens up for text chat, and the solution automatically detects your microphone and speakers, allowing for configuration-free audio communications. 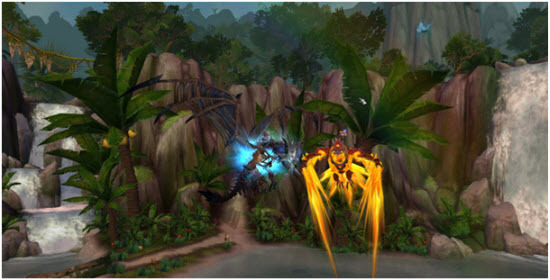 A complete \"newbie\" can log in, walk around, and start interacting in minutes. Advanced users can display presentations on any of the virtual display screens on the meeting room walls (I was able to share my desktop with Paul on one of the virtual screens with no trouble), and access a number of useful features (laser pointer, webcam sharing, file sharing, co-browsing, etc. ), and fun features (waving, clapping, gesturing, etc.). The almost complete lack of a learning curve is important, after all this is a business tool. The sooner users can get comfortable with the interface, the sooner they will stop \"playing\" with the controls and get down to business, whether it is watching a TEDx event, meeting with colleagues, or hosting a presentation for potential clients. If you have never played an immersive videogame, you may have trouble understanding the value of this solution. But you shouldn't be so quick to write it off as a mere novelty. Yes, that is my level 85 gnome in the screenshot above, and yes, my gamer background did draw me to cover this particular solution. But the value of the AvayaLive Engage solution is real. The popularity of Second Life is testament to the fact that this type of platform can be used for more than just gaming. Unfortunately for Second Life, they did not properly control the environment which left it open for inappropriate and un-businesslike behavior. Regardless, this type of technology inarguably provides a far more immersive, memorable, and interactive experience than a mere audio-call. Just because it may actually be \"fun\" doesn't mean it isn't a serious business tool.